Hit the road running at 2:30 am on Wednesday, 10-01-08 headed to the Salmon River in New York. Our expectations were high elevated by the reports of good flow forecasted at 750 CFS. Our group found the river less crowded than previous years for Wednesday, Thursday, and Friday mornings. Fish were coming through in sporadic pods, but not nearly as heavy as previous trips. We were attempting to present flies at these monster fish instead of the common 1...2...3 rip methods that most were using. Our hook-ups were quite fewer than this method, but we had hook-ups nevertheless. And when we had hooked-up, we experienced fewer foul hooked fish. With the flow at 750 CFS, the fish were much harder to land on our lighter leaders (12 – 10 – 8 # test Flouro-carbon line). It seemed our battle cry for the trip was FISH ON !....FISH OFF ! - Every day. LOL ! Friday afternoon and into Saturday saw many more fish pushing up the river systems, and we had many more hookups fishing areas that are well defined on any map in Pulaski, NY. It was exciting to step into a new spot, study the bottom structure and wait for that structure to change as fish would enter the area and then move on. We presented the staple salmon flies for the area….estaz-eggs, wooly-buggers, and egg-sucking leeches. No particular pattern was hot for us, however, yellow and fire orange estaz-eggs were talked about often. Etiquette on the river was much better than we've experienced with previous trips and we did not see or hear the usual gripes or elbow to elbow fishing. The drift boat guides were actually very gracious and it was quite fun to watch their clients running up and down the river with fish hooked fair or foul. The weather was mixed with rain showers, clouds and sun and the temps were comfortable. 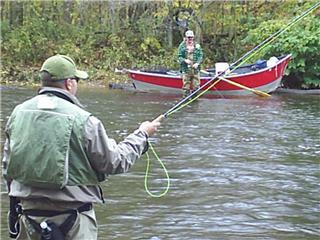 I myself am glad to be back for the start of our own steelhead fishing, and look forward to much less crowded water.